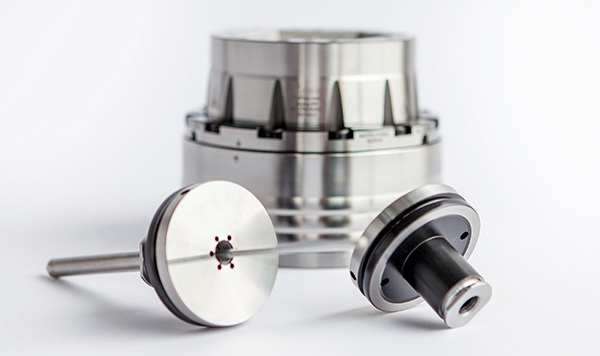 Clamping specialist Hainbuch is now offering users of its Mini Series, or the earlier Toplus or Spanntop chucks, an innovation that is designed to save time and money. Vario Part and Vario Quick end-stop systems already in the product portfolio have now been joined by a third variant, the Vario Flex. The pneumatic workpiece ejector pushes the workpiece from the chuck automatically. Pneumatic workpiece ejector depth can be adjusted by means of a retaining mechanism, and can be positioned in the machine exactly as required for the workpiece. Hainbuch’s Vario Flex workpiece ejector can also be used as a basic end-stop for coolant wash or air flush. To do this, the pneumatic spring is removed and a feed tube attached. The optional workpiece-specific end stop with holes for the wash and air-flush can then be mounted directly to the interface.